We’ve told you what you need to know about iTunes Match. But we’re also happy to share with you some secrets of iTunes Match that you don’t absolutely need to know, yet might enjoy knowing anyway. Trust that tucking these tidbits away will make you the star of every party—at least parties where everyone sits around and talks about the nuances of iTunes Match. When you tap to play a song on your iTunes Match-enabled iOS device, the song gets cached. That way, if you tap to play, say, “Je Suis Rick Springfield” by Jonathan Coulton on your iPhone today, the song won’t need to get downloaded all over again when you tap to play it again tomorrow. Similarly, you can tap to download complete playlists or albums on your iOS device; maybe you’d do so while on Wi-Fi so that you could hear all of Coulton’s latest album later during your commute home, without gobbling up your data plan. Of course, one of the benefits of iTunes Match is that you can free up extra space on your iOS devices by not syncing your entire library. Once you start downloading lots of songs as you play them back, does that advantage vanish? In a word: No. In more words: With iTunes Match enabled, your iOS device will automatically remove some downloaded songs over time. The algorithm is smart—older and least-played tracks are removed first. Apple hasn’t clarified under precisely which circumstances songs get removed. Perhaps one day we’ll see an option to control how much storage space iTunes Match can use for caching on your device, but no such option exists yet. So while you can manually remove tracks from your iOS device by swiping as if to delete them (which leaves the iCloud-stored track in place, but frees up the few megabytes the song requires), it shouldn't be necessary; your device will take care of eliminating old tracks automatically. iTunes Match won’t match very short songs, and it won’t match songs encoded with very low bit-rates. I found about 20 tracks in my library that were encoded at laughably low rates; each was marked Not Eligible. (You can find your tracks that iTunes Match won’t match by creating a Smart Playlist where iCloud Status is Ineligible and Media Kind is Music.) We haven’t found any tricks to start getting iTunes Match to match songs that are shorter than five seconds—though luckily there aren’t too many of those. We did, however, come across a workaround for getting the service to match poorly-encoded tunes. 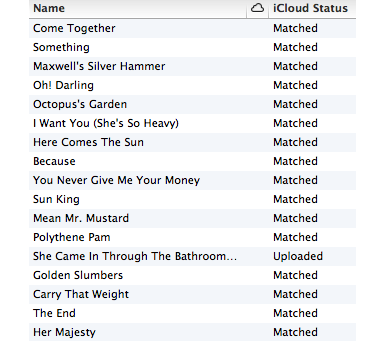 Re-encoding songs with lower bit-rates makes them suddenly eligible for iTunes Match matching. Control-click (or right-click) on the offending song(s) in question, and choose Create AAC Version from the contextual menu that appears. (If you’ve tweaked iTunes’s importing settings, that option may read differently; verify your settings in Preferences -> General -> Import Settings.) iTunes will re-encode the selected tracks with a higher bit-rate. This alone won’t improve the quality of the song: It’s a bit like using your DSLR camera to take a photograph of a Polaroid picture. But iTunes Match will look at the new track and see a better bit-rate, and will then make the converted track eligible for matching. 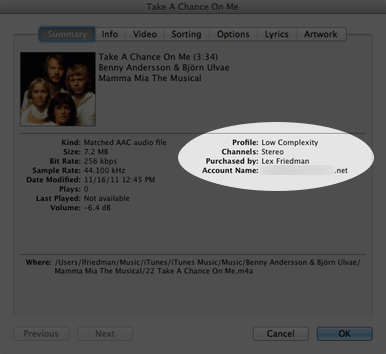 Yes, you can use iTunes Match to download better-encoded versions of songs you already own. And yes, those versions that iTunes Match provides will indeed be free from DRM restrictions. But—not that you ever would consider this, dear reader—think twice before sharing your newly-acquired, high-quality, restriction-free music with the Internet at large: Your iTunes Match downloads, like your iTunes Store purchases, are linked to your good name. Matched songs are DRM-free, but they're still linked to you. Click on an iCloud-downloaded track in iTunes and choose File -> Get Info, and you’ll see your name and iTunes email address as part of the song’s metadata. Were you to share your new, better-quality version of “Stacy’s Mom” with the Internet at large, and were your copy of that track to explode around the globe through various illegal file-sharing networks, your name and email address may well be attached—and be of considerable interest to Fountains of Wayne (or its record company, or its record company’s lawyers). It’s possible and legal to strip that personal data out through various, non-destructive means. Of course, you wouldn’t use such an approach—like instructing iTunes to convert the song into another 256-kbps AAC file—for nefarious or illegal purposes. When iTunes Match can find a copy of your song on Apple’s servers, it doesn’t bother uploading the song file; Apple already has a clean, well-encoded copy available. When iTunes Match can’t match your song, that song gets uploaded to your iTunes Match cloud storage instead. The Beatles's She Came In Through The Bathroom Window just won't match in our testing. We believe the issue lies on Apple's end. So, Beatles fans, if you check your Abbey Road album in iTunes, you may well note that every track is listed as Matched save for one: “She Came In Through The Bathroom Window.” We’re not psychic; rather, we’ve simply noted across various Macworld editors and friends that—for reasons unknown—that track almost never matches properly unless you bought it from the iTunes Store. (One person in our experimentation did successfully get a ripped copy of the song from a Beatles box set to match successfully.) We’ve found numerous examples of other songs from all sorts of artists with the same issue: For a given album, some tracks will match and others won’t. Since it’s frequently the same song that doesn’t match for different folks, it’s likely that the matching problem is on Apple’s end. We’ve asked Apple for clarification on why the Bathroom Window issue exists, and on whether songs will automatically switch from Uploaded to Matched once Apple corrects any issues on its end, and will report back once the company responds.